The way we think about giving and getting feedback strongly influences our personal growth as leaders. If we think about feedback as "criticism", we're less likely to benefit from useful suggestions. If we consider feedback as an opportunity to learn and grow, we will place a higher value on feedback - both when we give and receive it. Giving and receiving feedback is an integral part of our organizational culture at The Mountaineers. From staff, to volunteers, to members, we strive to create a healthy loop of feedback that allows us the opportunity to continually evaluate, assess, and improve our programs! After each activity, participants receive an email prompting them to provide feedback about their recent outing with The Mountaineers. What was their overall experience? How would they rate their leaders and instructors? Did the learning outcomes meet their expectations? What was their favorite part about the activity, and what would they have changed? We encourage participants to take the time to provide feedback after every activity, and we encourage our volunteers to review their feedback with an open mind! As a leader or instructor, please remind participants to complete their feedback surveys after each activity. While there are many ways to receive feedback after a trip, it's especially helpful to have feedback documented on The Mountaineers website. This allows our leaders and committees to learn from one another, and to grow as a community. In addition to our standardized surveys, there are many other opportunities for our volunteers to give and receive feedback. The Mountaineers encourages leaders and instructors to consider feedback as an opportunity to improve their personal leadership, and also to improve our programs. But feedback - particularly constructive feedback - can be both difficult and uncomfortable to give and to receive. As you interact with your peers during courses, clinics, and trips, we encourage you to keep the following tips in mind! Assess your motivation. Is your intent to help this person? If not, reconsider and reassess. Feedback should never be for your benefit, it should always be to help improve the person’s skills or their situation. Make sure that the person is open and ready to receive feedback. There is nothing worse than unsolicited and unwelcome feedback. Establish a tone of trust and caring before delivering any feedback. It is much more impactful to receive feedback from someone who you respect. Invite the person to assess their own performance. This makes feedback less confrontational, and you may find that they are already well-aware of their strengths and weaknesses. Be specific! Ask the person what they are working on, and provide specific feedback based on their performance in that area. Be objective, and focus on actions instead of intentions. This allows the person to explain their motivations, and may give more insight into their actions. Give genuine, positive feedback - and give it often. No one likes a “sh*t sandwich”, and even when they are well-intended, they often come off as inauthentic. Be thoughtful and honest, and avoid filler feedback to “lessen the blow” of constructive feedback. Ask for feedback! When possible, be clear about when and how you like to receive feedback. Be specific about what you’re wanting to improve, and ask for feedback about your performance in that area. Assume positive intent, and think about feedback as “constructive” instead of “negative”. Take feedback at face-value, and use it to improve your personal skills! Don't beat yourself up and take it too personally. Take the time to respond to feedback, instead of reacting. Instead of immediately defending your actions, repeat back what you’ve heard and give yourself some time to process the information. Remember that it’s okay to make mistakes. This is how we learn, and constructive feedback is an integral part of that learning process. Say thank you. Be grateful for the chance to receive feedback, and appreciate of the person who took the time to support you. This will open the door for more feedback, increasing your opportunities to learn and grow! 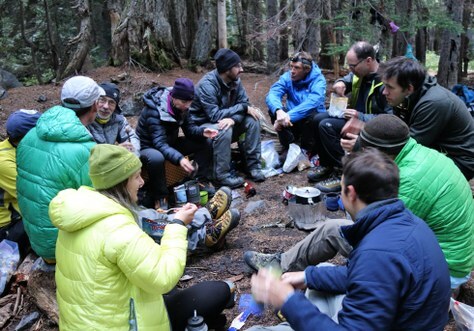 At The Mountaineers, we’re fortunate to have a wide and diverse membership. Many of the individuals in our community have long careers in management or education, with years of experience giving and receiving feedback. Please share your tips to help improve and empower our community! Mountaineers value safety, both physical and emotional, as part of our programs and organizational expectations. Consider the impact that a healthy culture of feedback can have on an organization's ability to provide for physical and emotional safety during outdoor activities!